is now being pressed. 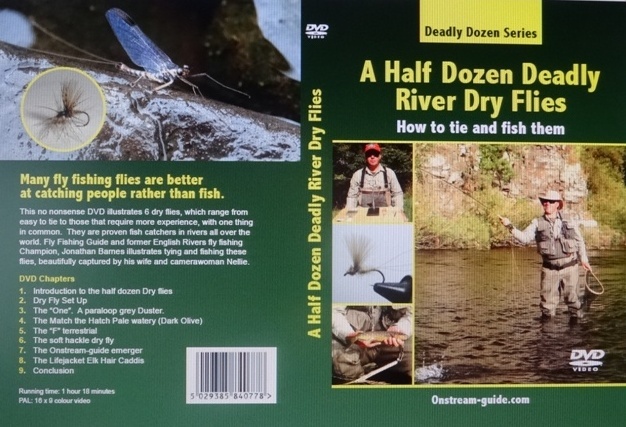 It deals directly with the fascinating topic of river dry flies and specifically tying and fishing 6 great fish catching patterns such as the Elk Hair Life Jacket caddis, a paraloop Grey Duster, the Soft Hackle dry fly and others. Future DVDs will deal with nymphs, spiders and streamers! The dry fly DVD will be available to purchase on the site from 10th January or if you are planning to visit the British Fly fair we will reserve a copy for you. We look forward to seeing you there. 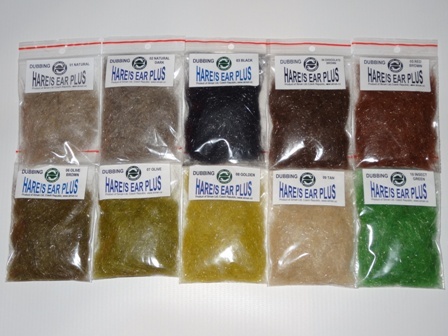 If fly tying interests you then do check our latest range of fly tying materials including tungsten beads and hooks at onstresam-guide.com. We use exclusively our products in the DVD and I and other professionals rate our dubbings as some of the best available. 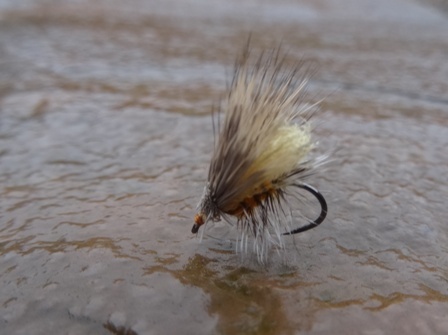 These are sourced in the Czech Republic a country where river fly fishing is taken very seriously. For those of you who do not tie your own flies our fly range and accessories (including titanium tippet rings) will be available in the next week. 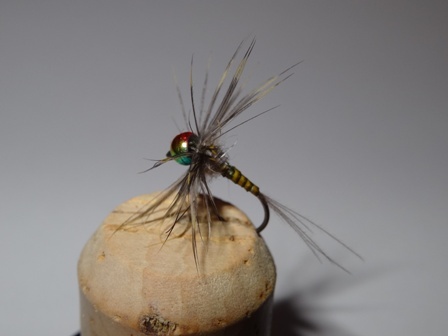 This will include new fly patterns such as the rainbow nymph. After extensively trialling, this nymph performed beyond our expectations, landing six consecutive grayling on a three fly outfit (it was only one of the three flies). The other flies included what I term usual dead certs including the Black Magic and Polyphaetis nymphs. As a scientist I would therefore use the term a strong positive correlation between using the rainbow nymph and catching fish. I had no hesitation including it in our latest offerings. Other new flies include the Life Jacket Caddis Light. This is a smaller more compact version of the old favourite duo fly. It is tied on a size 14 Maruto barbless Japanese hook and is subtle and small enough to fool most wild brownies but it still supports the weight of small nymphs (up to 2 mm tungsten bead). We are now heading towards spring and a new year lies before us waiting to be discovered. In fly fishing rather like life no one year is like the previous. Hatches of flies maybe spectacular or conversely might not happen. Part of the inherent interest in nature (a major part of river fly fishing for wild fish) is its unpredictability. When we challenge nature by fooling such a simple thing as a fish, a salmo trutta using an artificial fly it is in my view one of the ultimate tests of man’s ingenuity. It requires comprehension, observation, imitation, stealth, skill, accuracy and continuous updates. In a world where connectivity is usually signified by Wi-Fi we are lucky to have such a direct connection to nature via river fly fishing. With improving weather/river conditions we will endeavour to get out with the camera and produce some more features for our You Tube channel. If we are very lucky we might even get a go this winter. Given the wet weather is forecast well into next week this seems hopelessly optimistic at this stage. This is a shame because we are desperate to illustrate the new flies including the rainbow nymph. We will keep praying for a calm period so we can all enjoy the rivers and streams again. At Onstream-guide Nellie and I, wish you all a successful and joyous New Year. We hope the trout are plentiful and free rising for you in spectacular and wild scenery in 2016. We look forward to seeing you on the 13th and 14th February at the British fly Fair at the Staffordshire County Showground (ST18 0BD). Best wishes, Jonathan and Nellie.